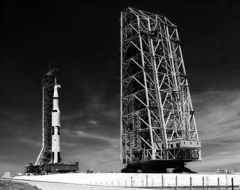 The numbers that express the scale of the Saturn V are often quoted: 110 metres tall, 10 metres wide, weighing about 3,000 tonnes at launch. There was, however, something about this vehicle that surpassed quantitative expression. This was a sleek, white, slender ship that rose to the heavens like no other machine before or since. It was not only functional; it was beautiful and seemed to be perfectly styled for the task of taking mortals to heavenly realms. Moreover, its beauty was set against the ugliness of the steel towers that nursed it to the point of its departure. Chock full of extreme technologies, this ship hid many ways to kill or injure the men who would ride it. Yet it, and the smaller Saturns that preceded it - all of which were swords turned to ploughshares; peaceful ships derived from military technology -had an excellent record of success, in some cases flying on in the face of failure and danger to reach their peaceful goals. The mobile service structure near the Apollo 4 space vehicle. everything associated with the final stage of getting a rocket off the ground coordinated their tasks. German film maker Fritz Lang is usually credited with introducing the concept of the countdown as a device to raise suspense in his 1929 film Frau im Mond (The Girl in the Moon). It was adopted by the German rocket pioneers in the VfR, who maintained its use after their move to the United States. The countdown was not continuous as it progressed towards the launch. At preplanned points it was deliberately paused to allow engineers to catch up with tasks and resynchronise their preparations. In many cases, these holds allowed small technical gremlins to be chased and rectified. If a problem seemed to require a longer time to correct, a hold could be extended, but only up to the point where the delay would Apoll° 16 on Pad 39A two weeks pri°r to push the time of launch beyond flight' acceptable limits. Although the countdown has been retained in the American rocket industry, its precise implementation can vary. In the case of the Saturn V, the descending count eventually led to the point where the vehicle left the pad and began its flight. 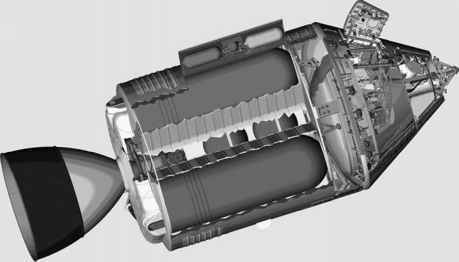 With other rockets, such as the Titan II that lifted the Gemini spacecraft to orbit, the zero point was when the engines were ignited.